Open Eye Figure Theatre's The Red Shoes, created by Joel Sass, was one of my favorite shows of 2017. So when I heard they were doing a (sort of) sequel to that piece, I was all in! 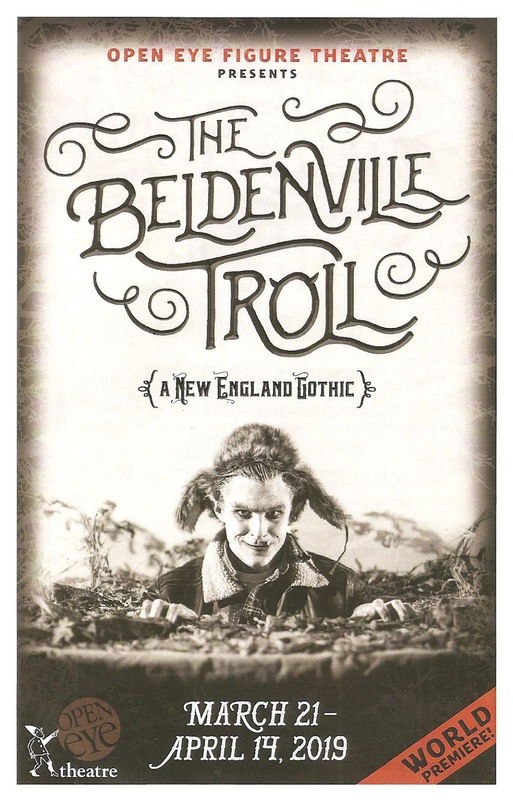 The Beldenville Troll shares no characters, plot points, or locations with The Red Shoes; it's more of a thematic sequel, in which they "continue our creative grafting of fairytale themes and folklore onto surprising modern settings by utilizing a creep museum of compelling artifacts, animated shadow puppets, and live performers." It's another unique and ingenious creation from Joel Sass and the team, and what I wrote about The Red Shoes also applies here: "My immediate thought at the end of the show was, 'how do people think of such things?' The Red Shoes The Beldenville Troll is something so curious and unique, odd and chilling, inventive and charming, it's thoroughly captivating from start to finish." 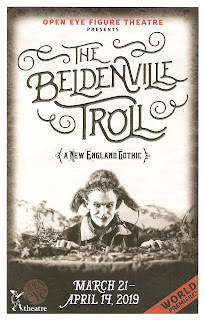 Seeing the show last night, I totally believed that this little town of Beldenville, Maine existed, with town lore of a troll that lived in the train tunnel in the mountains. You know, one of those old stories made up to explain mysterious goings on in the world. The lobby of the theater has a display of artifacts that are purportedly borrowed from the Beldenville Museum. I bought it, that this was an imagined story around this real place and legends. But a google search today turns up nothing for Beldenville, other than Open Eye. I am a little (or a lot) on the gullible side, but this is how thorough and convincing this piece in its storytelling. The 75-minute story explores this legend through the life of an odd and lonely boy (gifted physical actor Neal Skoy in perhaps his best performance, with not a word uttered), who may be a troll changeling. He sets up camp at the closed tunnel's entrance, below a bridge, where lots of creepy things are found - empty beer bottles, pieces of mannequins, an old radio, and other trash. His only companion is a doll with red hair, who at some point in the show comes to life (played by Chloé Bell). We see their sweetly awkward meeting at a school dance, two misfits who find solace in each other, and their pursuit out to the tunnel where they can be alone and be themselves. We also learn about the boy/troll's childhood and possible changeling life through charming shadow puppet shows, and about the troll and town mythology from radio broadcasts. It's all a very detailed and thoughtful creation that tells this sad and sweet little story. Joel Sass is such an inventive artist, both as a designer and as a director, and perhaps no place allows him to showcase his talent and creativity more than Open Eye, where truly anything is possible. The tiny stage already has a brick arch, which perfectly frames the arch of the tunnel. Train tracks lead into the tunnel, walled off but open in some scenes, with odd and delightful flotsam and jetsam littering the space. 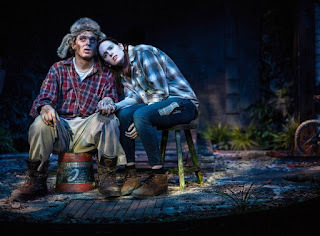 The performers (also including Kalen Rainbow Keir and Max Mainwood, primarily behind the scenes making all the things go) are so playful yet precise, as they convey a range of emotions and storyline points through physicality and prop use. Lighting designer Bill Healey and sound designer Sean Healey return from The Red Shoes, their design important pieces in creating this world and telling this story (pay attention to the pre-show song list, all of those wonderfully morbid teen love story songs like "Teen Angel"). 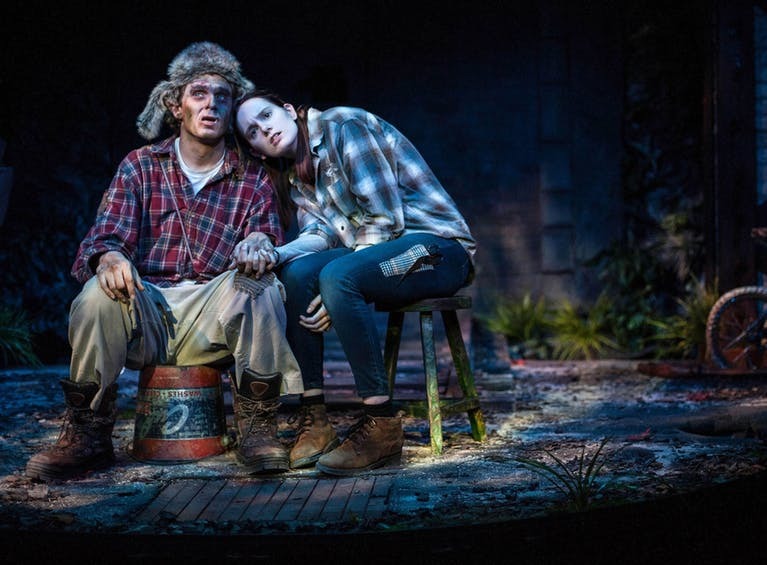 The Beldenville Troll: A New England Gothic is a unique and inventive piece of theater that you won't see anywhere else. It requires a level of concentration and participatory imagination as much of it is performed without words. Lean into it and become absorbed in this new Gothic fairytale, so specifically and thoughtfully brought to life by this team of artists. The show continues through April 14 - see Open Eye's website for details, and note that this small performance space often sells out. It's general admission seating so get there early to get your seat (perhaps the widest in #TCTheater), and spend the time perusing the totally real museum exhibit. Pro tip: you can park in the lot kitty-corner across 24th and Portland.